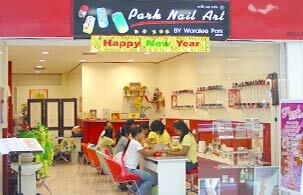 Park nail Art Phuket is located at Big-C Phuket. We are providing ourselves on our manicure and pedicure techniques. Perfection is a nail manicure and beauty salon offering services and manicure salon, design for both women and men. The only truly 'full service' beauty salon on Phuket, a full range of manicure set styling and nail care services are available. We are services for both men and couples and for the ladies, we is the private mini spa with a not extensive with special discount of services and facilities. We have a more experience for 4 years to service about nail care, manicure and providing tutorial about nail art from a professional nail care in Bangkok and South Korea. Park nail Art is location at Big-C Phuket. We are providing ourselves on our manicure and pedicure techniques. No detail is ignored as we thoroughly cleanse, groom and restore the condition of your hands and feet. All manicure and pedicure treatments include soaking, nail shaping, cuticle care, moisturizing cream and polish to perfection.